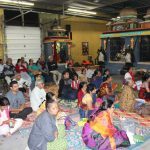 The grand culmination of the Madura Utsav at DFW temple took place on Sunday, November 25th 2012 with Rukmini kalyanam. The audience listened with rapt attention, the most talked wedding for centuries. 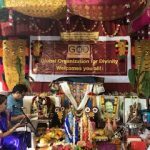 The GOD volunteers had set the scene for a visual treat with Krishna in all His glory at the side,while little Gopikas welcomed the bhagavathas with rose water, flowers and sandalwood paste. Shri. 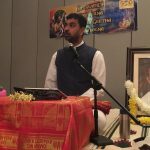 Ramanujamji started off with explaining about Rasa Leela and reciting few slokas from Pranaya Geetham and Gopika Geetham. 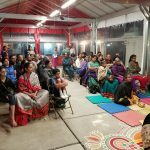 The mind set of Gopikas was described so clearly, only then could one truly understand the dasa bhavam and as to why the lord chose those blessed few to take part in Rasa Leela. Sri Ramanujamji then gave another analogy and expalined why the lord disappeared during Rasa Leela, which was to dispel the pride of spirituality (that Iam a great bhaktha of Bhagawan), and when the Gopikas realized that and are heart broken, the lord reappears. Shri.Ramanujamji went on to explain Gopika Geetham which is the jewel of Bhagawatham, and the definition of love – pain in Separation and Joy in Union. The Gopis were of three kinds. Firstly, those who were there for the lord from childhood. Secondly, those that did not marry and accidently came to lord Krishna. Thirdly, those that were married to someone being Pathivrathas came to Lord Krishna. 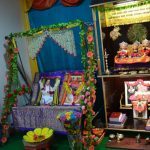 The incidents leading to Rukmini Kalyanam were depicted with beautiful description of Rukmini devi and how she heard about Krishna’s beauty and valor which made her fall in love with Him. Sri Ramanujamji expounded how Shri.Hanumanji took the role of the brahmana who carried Rukmini’s message to Krishna to come and marry her. The divine vivaha took place according to our shastras. To attain Krishna one should be totally absorbed in Him like Rukmini devi.